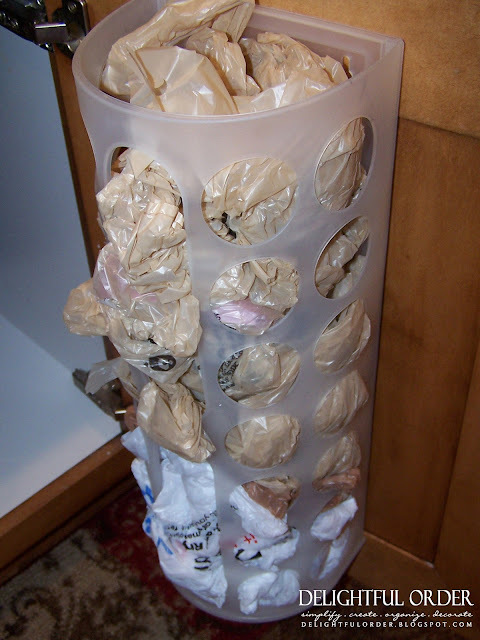 So how is your spring cleaning/organizing going? I've been finishing my kitchen cabinets. Today, it's about reclaiming order under the kitchen sink. 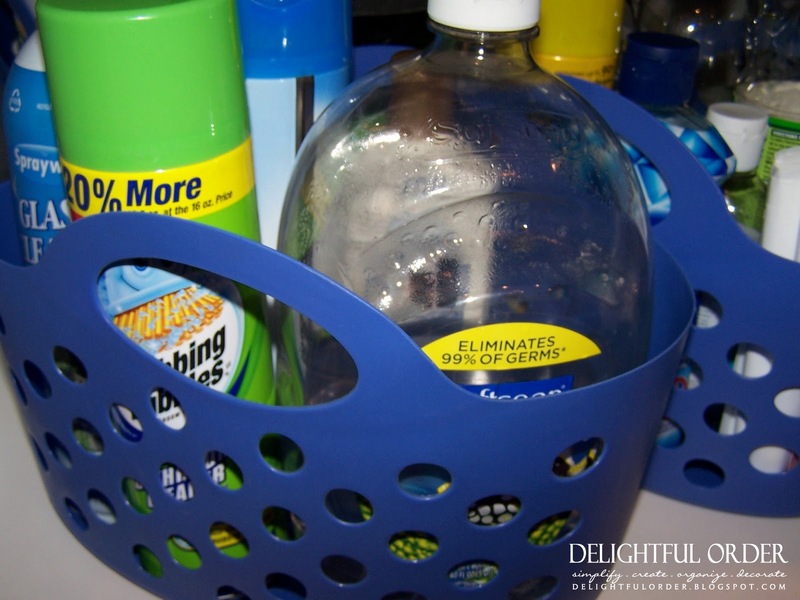 The baskets are once again, from the Dollar Tree. They hold everything under my sink. It's nice to have it all contained. 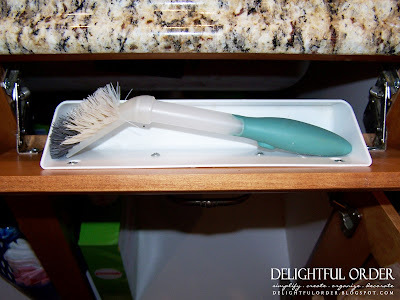 I have these great drawers to hold scrubbing brushes, etc. I got this bag holder from Ikea a while back. 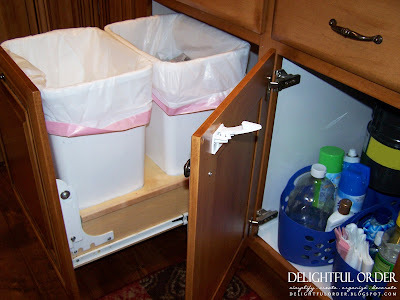 No need for a garbage can underneath, as I have a sliding garbage, right next to it. and my cabinet has child proof locks to keep the little ones out. Organizing under the kitchen sink doesn't take a lot of time. Now, let's see yours. Make sure to post before and after photo's of your kitchen organizing and come back here on Thursdays and link up your Delightful Order to my PARTY. Under my kitchen sink is my icky spot in my kitchen. Thank for the inspiration. Great idea using the baskets from Dollar Tree ... I need to shop for some! Love that bag holder from Ikea...might have to check those out. I also spent like $10.00 on a "cleaning supply" bucket...but I think those Dollar Tree baskets are super cute!!! Oh well...thanks for sharing!! Oh, do I ever need to do this. Love your blog! 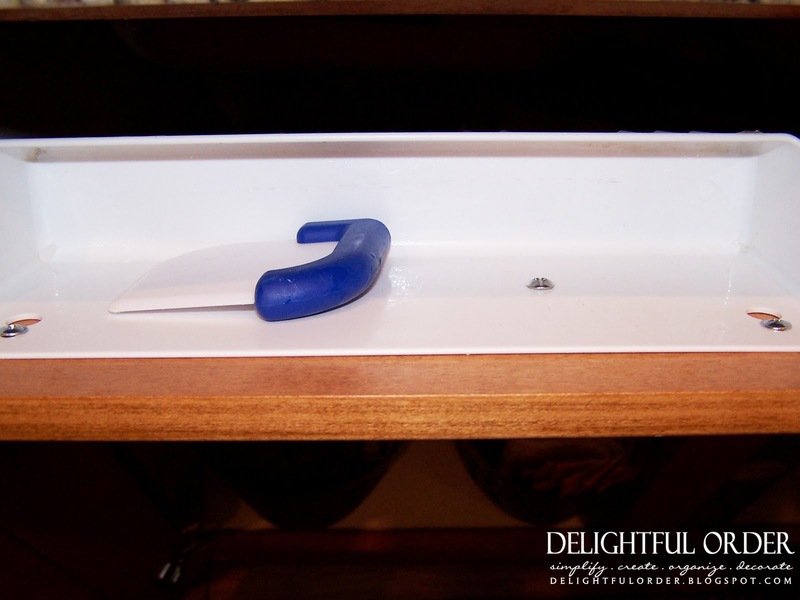 Found you via a bowl full of lemons link up party and I'm now subscribing to your blog! I need to go get those containers. i have seen them and have tried organizing under my sink, but I still have things that need to be contained! Looks great! You've inspired me to get to work on mine! Thanks for the inspiration and motivation! 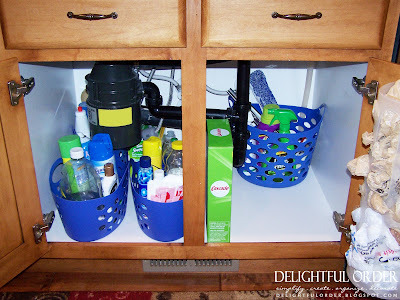 I just organized under my sink last week, and will be helping a client with hers next week. (Didn't know how to post my before/after pics here, but I have some!) Keep up the great work! this is sooooo refreshing! i love clean and neat ideas. i'll pass this onto the not-so-neat family members of mine. 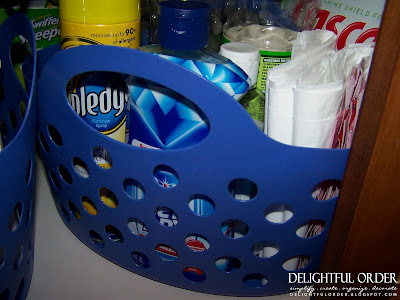 I never would have thought to use plastic baskets with handles. 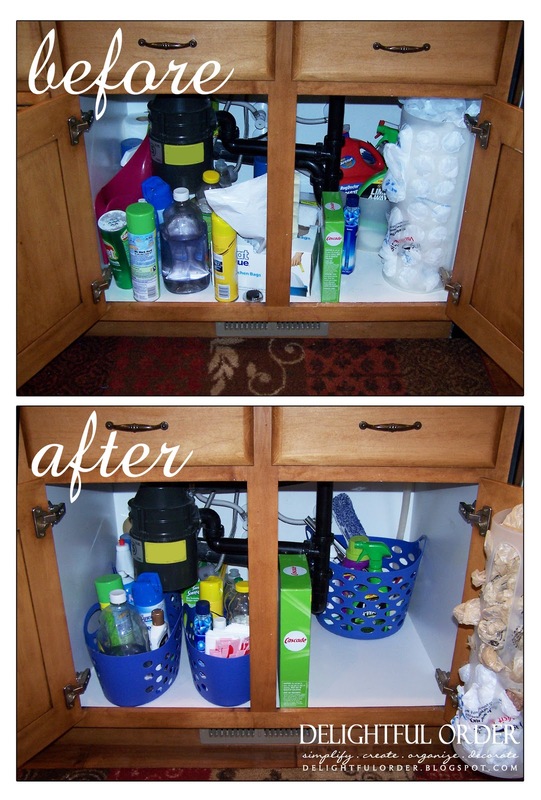 I love organization, and this looks great. I love the little drawers and your cabinet for the garbage cans. Thanks for linking to We're Organized Wednesday. I mentioned this somewhere already, but I use inexpensive peel and stick tile to line the bottom of my old cabinets. Makes for an easy cleanup. I used up all the leftovers from a basement project years ago and bought more today for 65 cents a tile. Absolutely love all of your inspirational ideas. I have a knack for organizing, but you are way ahead of me. I also have used the tupperware that you use, and the ikea baskets, but I think I'm heading out to shop tomorrow for other things that you've used. 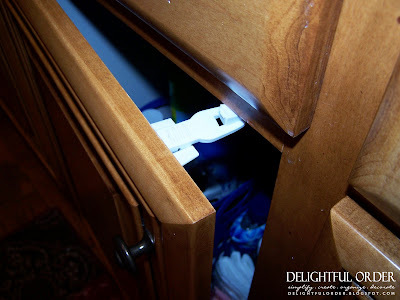 I love the curtain brackets that you used for the wrapping paper. I am at a loss for space, so I used tension rods in a window frame that doesn't get much light. I also put all of my spools of ribbon on tension rods. My pantry shelves are very deep, and although they hold a great deal, so much gets lost back behind there. I may have to rethink the size of them. You've done a fabulous job! Thank you for sharing. I am headed out to the Dollar Tree for some baskets as soon as it opens! In the meantime, now that I am up (it's 4am here) I am going to work on my pantry. I actually have 2 areas of "pantry" so it's time to get to work. Thanks again for all the wonderful tips!